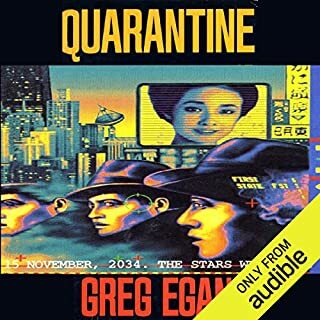 It's the late 30th century, and mankind has splintered into diverse beings: the human fleshers, the Gleisner robots, and the artificially intelligent polises. Polis orphan Yatima has traveled back to Earth as an interstellar disaster is about to destroy the planet, beginning a monumental struggle for survival. 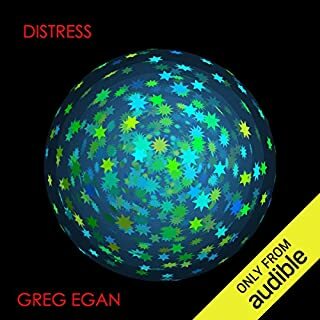 Greg Egan explores issues of human identity in a future world. 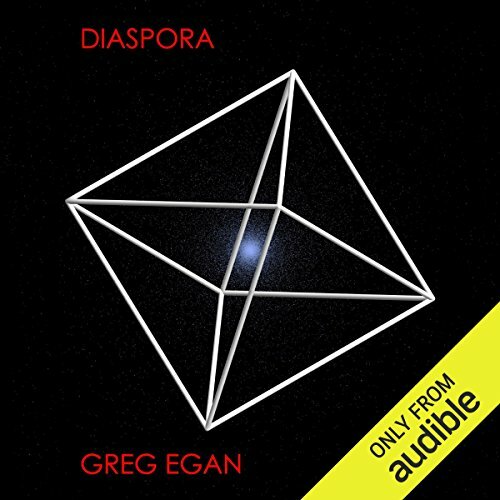 It's a heady concept that is grounded by Adam Epstein, whose sober and clear-headed approach - as well as his judicious use of accents to delineate the characters - makes Diaspora a fascinating exploration of human existence. And there are the holdouts. The fleshers left behind in the muck and jungle of Earth - some devolved into dream-apes; others cavorting in the seas or the air; while the statics and bridges try to shape out a roughly human destiny. But the complacency of the citizens is shattered when an unforeseen disaster ravages the fleshers, and reveals the possibility that the polises themselves might be at risk from bizarre astrophysical processes that seem to violate fundamental laws of nature. The Orphan joins a group of citizens and flesher refugees in a search for the knowledge that will guarantee their safety - a search that puts them on the trail of the ancient and elusive Transmuters, who have the power to reshape subatomic particles, and to cross into the macrocosmos, where the universe we know is nothing but a speck in the higher-dimensional vacuum. What disappointed you about Diaspora? The ve/vis pronouns take a little getting used to, but other than that no complaints. This is the second book I've tried to get through by Adam Epstein and I would not be willing to try another of his attempts at narration. The voices he does are overly cartoonish and grating and he mispronounces words constantly. 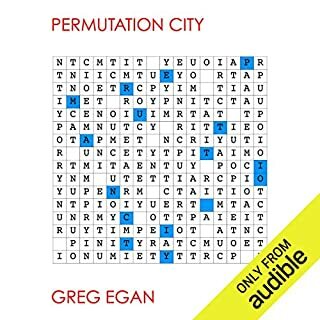 If he's going to narrate so many of Greg Egan's books, he could take a few minutes to figure out how to properly pronounce things. 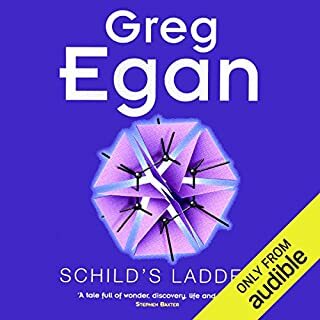 Thankfully someone else narrates my favorite of Egan's books, Schild's Ladder. 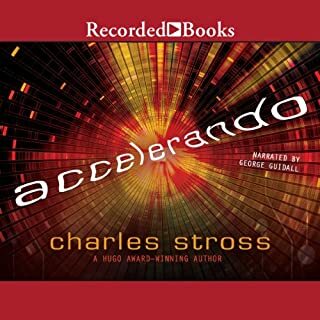 Strike three of the Kindle-Audible sale books. 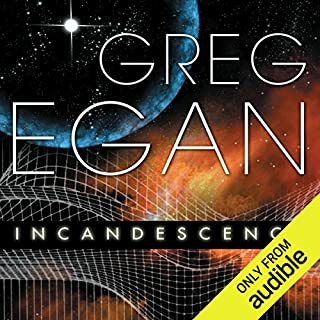 Egan is very interesting...until you hear it from the mouth of this reader. If only the energy of his introductions flowed into his reading of the text...might be able to listen to this. Do you have the program to enjoy this book? Very "hard" sci-fi, Diaspora's main characters are AIs, the protagonist being "born" early on. They can run points of view that allow them to enjoy a work of art as if it were someone else perceiving it for instance. There's no faster than light travel and this isn't a space opera, it's an introspective tale of exploration. If you're frustrated with science fiction that let action get in the way of rigorous explanations of the science behind what's going on, this book is for you! Don't worry. You get used to the narrator. I didn't like the style of the narrator at the beginning but I was able to get accustomed quickly. I was recommended this book as I am a fan of hard science fiction such as the works of Asimov, Poul Anderson and Arthur C Clarke. However the experience was ruined for me by poor narration. The guys voice is monotonous and annoying. I couldn't bear it so I stopped listening. Perhaps I'll read a hard copy or e-book version in the future since the premise of the story seems interesting. Made 2 attempts at this but was not rewarded for the effort. Scientific self-flagellation. Author seems to have forgotten that someone might try to read it. This is a Hard science fiction book. So be prepared for alot of dense physics and complicated concepts. That said, it is one of the best sci-fi novels I've ever read. it's scope is mind bogglingly epic and the world building is superb. The civilization and technology are extremely well thought out and beautifully written. I would it give it 10 stars if I could. I'd read this book before listening to it, and I knew I love it still I struggled to get into this. I can't suggest this as a way of getting acquainted with the book. I would have given the book 6 stars if I could. It pushes the limits of the genre. it pushes the limits of what's possible by systematic thinking in literary form. A book that tries to encompass a posthuman scape stretching from horizon to horizon. Sci fi as hard and precious as diamond. I've read nothing quite like it. It throws the physics text-book at you but still imagines an incredibly comprehensive future for humanity.